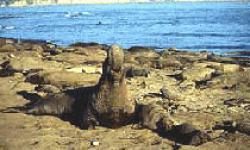 Ano Nuevo State Park in Pescadero, California is a 4000 acre reserve and major gathering of northern elephant seals year round. 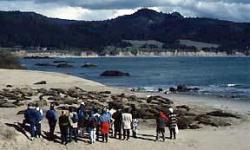 Ano Nuevo State Park protects the scenic, biological, ecological, and cultural values of the central California coastline, and elephant seal guided walks are available from December 15 through March 31. 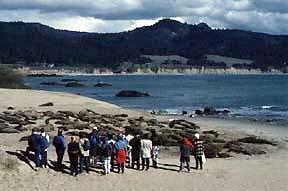 Here there are significant wildlife habitats, sensitive native dunes, coastal terrace prairie habitats and diverse inland plant communities and more, all protected by the Ano Nuevo State Park, including old growth forest, freshwater marsh, red alder riparian forest and knobcone pine forest. Visitors here can enjoy a picnic but no food and beverages are sold on the premises.